THROTTLE CABLE, 42 1/2", BLACK 42 1/2" LONG, 90* ELBOW, 5 1/4" TRAVEL OEM# 56379--97 ..
THROTTLE CABLE, 42 1/2", BLACK42 1/2" LONG, 70* ELBOW, 3 3/4" TRAVELOEM # 56327-81BFITS '84-'8..
THROTTLE CABLE, 38", BLACK 38" LONG, 70* ELBOW, 5" TRAVEL OEM # 56327-90FITS '95 FLHT, '90..
THROTTLE CABLE, 38", BLACK38" LONG, 70* ELBOW, 5" TRAVELOEM # 56327-96FITS '96-'01 FLHT, '96-'01 FLH..
THROTTLE CABLE, 32 1/2", BLACK32 1/2" LONG, 90* ELBOW, 5" TRAVELOEM # 56356-96, 56396-96AFITS '07-'1..
THROTTLE CABLE, 32 1/2", BLACK 32 1/2" LONG, 90* ELBOW, 5" TRAVEL OEM # 56356-92FITS '95 F..
THROTTLE CABLE, 30", BLACK 30" LONG, 90* ELBOW, 5" TRAVEL OEM # 56343-90FITS '90-'95 FXSTC..
THROTTLE CABLE, 30 3/4", BLACK30 3/4" LONG, 90* ELBOW, 5" TRAVELOEM # 561000-56, 56343-01, 56356-96,..
BLACK THROTTLE CABLE 39 1/2" LONG, 70* ELBOW, 5 " TRAVELOEM # 56526-02FITS '02-'07 FLHTC, '02-'.. IDLE CABLE, 42 1/2", BLACK 42 1/2" LONG, 90* ELBOW, 4 1/2" TRAVEL[does not come with compressio.. IDLE CABLE, 42 1/2", BLACK 42 1/2" LONG, 70 * ELBOW, 4" TRAVELOEM # 56328-81BFITS '84-'87 FLHT,.. IDLE CABLE, 38", BLACK 38" LONG, 70* ELBOW, 4 3/4" TRAVEL OEM # 56328-96 FITS '96-'01.. IDLE CABLE, 38", BLACK 38" LONG, 70* ELBOW, 4 3/4" TRAVEL OEM# 56328-90 FITS '95 FLHT.. IDLE CABLE, 31 3/4", BLACK 31 3/4" LONG, 90* ELBOW, 4 3/4" TRAVELOEM # 56355-92 FITS '95 F.. IDLE CABLE, 31 3/4", BLACK 31 3/4" LONG, 90* ELBOW, 4 3/4" TRAVELOEM # 56355-96, 56355-96AFITS .. IDLE CABLE, 30" BLACK 30" LONG, 90* ELBOW, 4 3/4" TRAVEL OEM # 56342-90FITS '90 FXST, '90-.. IDLE CABLE, 30 3/4", BLACK 30 3/4" LONG, 90* ELBOW, 4 3/4" TRAVEL OEM # 270000-04, 56342-0.. CLUTCH CABLE, 68 11/16", BLACK 68 11/16" LONG, 31 1/2" from TRANS to ADJUSTER LOCATION, 3 1/4" .. 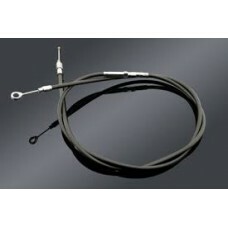 CLUTCH CABLE, 64 7/16", BLACK 64-7/16" LONG, 32 15/16" from TRANS to ADJUSTER LOCATION, 2 3/4" .. CLUTCH CABLE, 64 11/16", BLACK 64 11/16" LONG, 31 1/2" from TRANS to ADJUSTER LOCATION, 3 1/4" .. 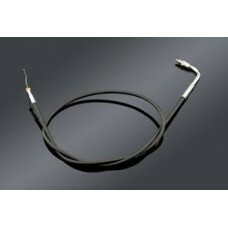 CLUTCH CABLE, 62 11/16", BLACK, LATE 62 11/16" LONG, 25 7/16" from TRANS to ADJUSTER LOCATION, ..